Place all the ingredients in your blender or food processor and process for about 15-30 seconds or until smooth. Or you can make batter by hand. In a large bowl whisk the flour with the sugar and salt. In a separate bowl whisk the eggs and then stir in the milk, vanilla extract and melted butter. Make a well in the center of the dry ingredients and then gradually pour in the egg mixture, whisking until combined and smooth. Strain if necessary to remove any lumps. (The batter should have the consistency of light cream.) cover and let sit at room temperature about 15-30 minutes. Or place in the refrigerate to chill for one hour, or up to two days. After chilling the batter, if it’s become too thick, thin it out with a little milk or water. When you’re ready to make the Crepes, heat a 9 inch (23 cm) non stick frying pan or crepe pan over medium heat until a few sprinkles of water dropped on the pan sizzle, just a little. Adjust the temperature as needed. Lightly butter the pan. Lift the pan from the heat and using a small ladle or scoop, pour about 3-4 tbsp of the batter into the center of the hot pan. Tilt and swirl the pan so the batter forms an even later (does not have to be a perfect circle). Cook until the edges of the Crepes start to curl and the top looks almost dry (about 1-2 minutes). (The bottom of the crepe will have a golden brown lacy pattern.) flip the crepe and continue to cook for about 15-30 seconds or until you have brown spots over the surface. Remove from heat and place on a plate or wire rack. Continue to cook and stack the Crepes. 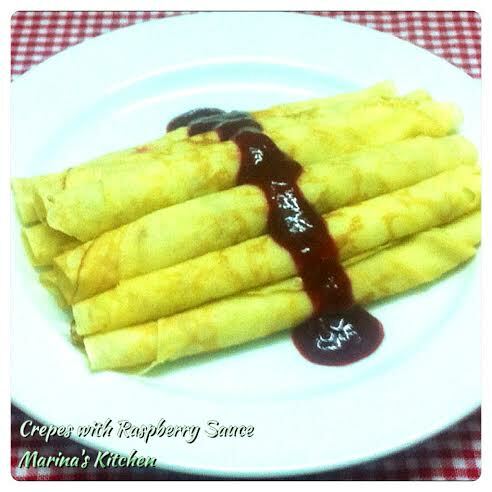 If you want to keep the Crepes warm, you can cover them with a clean cloth or a piece of aluminum foil. Or you can place them in a 150 degrees F (65 degrees C) oven. If not eaten right away the Crepes can be staked and wrapped in aluminium foil and plastic wrap and stored in the refrigerator for two days or they can be frozen for about one month. Reheat the Crepes in the oven or in a hot skillet.